It’s taken 11 years to accomplish but Canada has won a Gold Medal at the Asia Pacific Championships. It wasn’t a dream start for the Canadian duo but they hung in there are roared over the line to win GOLD. 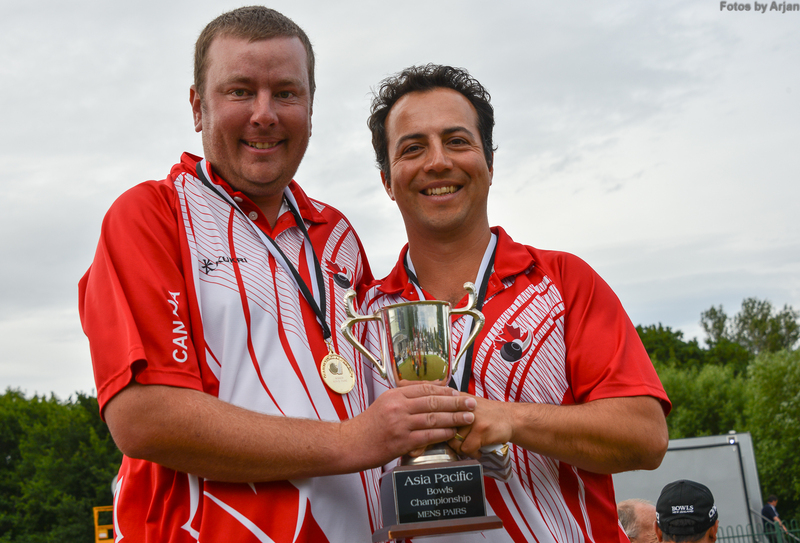 The 2015 Asia Pacific Championships came to a close for Team Canada with Ryan Bester and Steven Santana bringing home the gold medal in Men’s Pairs. The long time friends which dates back over 15 years when they used to compete against each other as Junior Bowlers and at U25 Championships, joined forces to make the top Team at this years tournament. Ryan Bester of Hanover, ON and Steven Santana of North Vancouver, BC defeated the 2014 Commonwealth Games silver medalists Muhammed Hizlee Abdhul Rais & Fairul Izean Abdhul Muin of Malaysia. Congratulations to both Stevie and Ryan on this huge effort. This is a great accomplishment for our Country and something that everyone should be proud of!